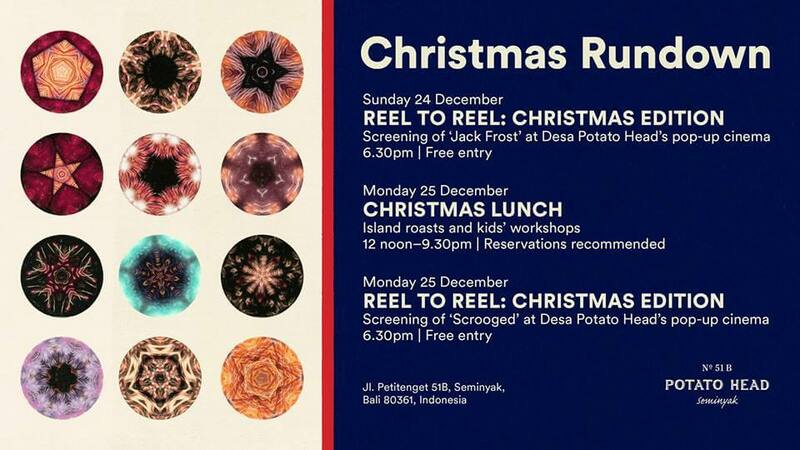 We’re hosting a series of family-friendly Christmas events this holiday season, starting with the first of two ‘Reel to Reel’ film screenings on Christmas Eve. Head over to the grass lawn above Escalier to see ‘Jack Frost’ on a specially erected bamboo projector screen from 6.30PM. Weather permitting, the film is open for all to enjoy, free of charge. The next day, Potato Head restaurant is hosting Christmas Lunch with island roasts and kids’ activities (IDR 180,000++ per person). In the evening, our tropical pop-up cinema returns with a special Christmas screening of ‘Scrooged’ from 6.30PM (free).